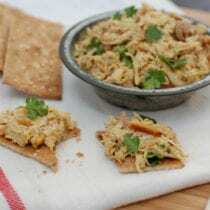 Inspired by my friend Amy Bishop with Greenbrier Farms (an organically run farm in S.C.), I am excited to share this tasty curry chicken salad recipe with you today. Chicken salad is traditionally made with mayo and unfortunately mayonnaise isn’t exactly a real food. The store bought versions are typically made with refined oils and also contain more than 5 ingredients. The homemade versions are more “real food approved” but oftentimes call for raw eggs, which I am on the fence about, plus we eat mayo so infrequently I don’t feel (for me personally) it’s worth the time to make it from scratch. So I’ve tried substituting plain yogurt in dishes like chicken salad, egg salad, and deviled eggs without much success because, frankly, I think plain yogurt is rather plain tasting and the flavor – or lack thereof – was a little too overwhelming in these dishes. So I was thrilled to be introduced to the idea of adding curry to chicken salad, because curry has such a wonderful flavor it totally makes up for what the yogurt is missing. I also want to make sure you know about our meal planning sponsor, eMeals. If you want to clean up your family’s diet but don’t know where to start then the eMeals Clean Eating Plan is your answer. Each week eMeals sends their subscribers 7 dinner recipes (including side dishes) along with a corresponding shopping list. Meal planning services are a great way to save time and money…and also keep you on track when it comes to avoiding highly processed food! If you are already an eMeals subscriber we’d love for you to share your feedback with us in the comments below. P.S. If you are keeping up with our Kraft petition be sure to check out our appearances on both Dr. Oz and CNN this week. Mix all ingredients together thoroughly. Serve on crackers (ak mak crackers pictured above) or bread and store leftovers in the fridge. Check out The Best Whole Chicken in a Crock Pot for a great way to get cooked chicken for this recipe! Ooh this sounds yummy! I have been using curry when I make tuna salad for about a year now, but it never dawned on me to use it when making chicken salad. Can’t wait to try this! When you do use mayo, do you have a preferred brand? I’m like you – I use mayo so infrequently that I’m more concernd with making the best choice than finding a substitute for the rare times I use it. I’ve been buying Duke’s – seems to have a simpler ingredient list (and less sugar) than other brands I could find on the shelf. Looks yummy! I have been using the eMeals Clean Eating menu for about 3 weeks now and I LOOOOOOOOOOOVE it. The recipes (with the exception of maybe 2) have been a hit. Especially with my husband who was seriously doubtful that ANYTHING would taste good. The recipes have even allowed for some leftovers for lunches. Looking forward to making this chicken curry! I was planning on roasting a chicken tomorrow for dinner (eMeals recipe from a couple of weeks ago), so this will be perfect with the leftovers! Use plain Greek yogurt instead of plain yogurt. Much creamier. I know you buy Organic but Fage Plain Greek Yogurt is about the best you can get. I use regularly and no body knows. My friend, the crock pot! And I had a wild idea to try a tofu version (no crock pot :)) for my husband, the Vegan. Just the right idea for tonight. Thanks! 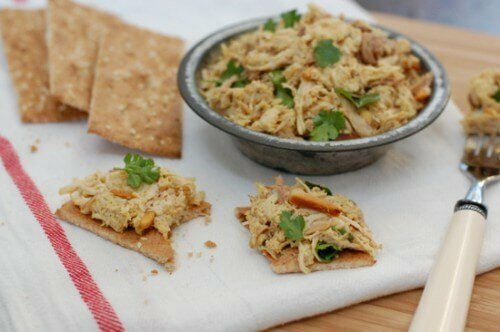 Try using hummus to make chicken salad. I prefer it taste wise to mayo and yogurt. It’s got a little creaminess and holds everything together and has just the right amount of flavor. Best chicken salad in the world: shredded chicken, halved grapes, diced apples and hummus. Seriously, give it a go! Brianne – I love that idea…never thought to use hummus! I have a lot of dried cilantro on hand that I dehydrated last summer from our garden. Any ideas of how much of this to use instead of the 1/3 cup of fresh leaves? Thanks! The traditional fresh herb to dried conversion is 3 to 1. i.e. 1 tablespoon fresh herbs = 1 teaspoon dried. So you need 1/3 of 1/3 cup, ha ,ha. Since 1/3 cup = 5 tbs + 1 tsp, 1/3 of that would be 5 1/3 teaspoons dried cilantro. Though the recipe does call for loosely packed cilantro, and that 5 1/3 teaspoons seems like quite a lot, so perhaps start with a teaspoon, taste and add another up to 5 1/3 teaspoons until desired seasoning level is reached. Missed the Dr. Oz appearance, but you were awesome on CNN this morning! I don’t eat meat any more, but when I did, I made chicken salad with celery, sliced almonds and grape halves, and used sour cream instead of mayo. I agree with Amanda that Greek yogurt would be better than regular yogurt. Perhaps the sour cream could be mixed with the Greek yogurt for my version. I rarely eat tuna, but mix it with curry or turmeric to mask the tuna flavor. I know it would be great with chicken. I used to make a Pampered Chef version that also had mayo, but included apples. Made it with lemon yogurt, which was really good. I’m going to have to try greek yogurt and lemon juice and zest and see how it is! Letting it sit in the fridge a few hours or overnight made it the best. After, going halfway to “Real Foods” last January when I put my family on the Feingold diet (no artificial anything and no preservatives), I myself have been eating the Whole 30 diet since the end of last year. Because the only oils allowed are coconut oil and olive oil, I have been making my own mayo. I have a Bosch mixer/blender and I can make it in 2 to 3 minutes. Completely worth the effort! I do not have everyone completely on the the Whole 30 (kids and hubby are allowed grains) but I am seeing even further improvement in the kids’ behavior as I go more and more natural. I use organic, pastured eggs and don’t worry about them being raw. The risk of salmonella is low if you know your source and know the farmer cares for the hens well and doesn’t cramp them together. But then I do raw milk too! My kids HATE it now whenever I miss a pickup because we are out of town or something. About chicken curry salad – try it on top of cantaloupe! Absolutely scrumptious blending of flavors. Finally, as my teenage kids say “You were boss on Oz yesterday!” :-) So sorry I missed you on CNN today. I may go to their website to see if the clip is there. Try using whipped cream for your base. It gives your chicken salad a slightly sweeter taste and it keeps it lighter. That’s how we made it when I worked in a Victorian tea parlor. Just make sure your chicken is chilled. It was delish and a big hit! Nice. I like to add apples and/or raisins too….Mark Bittman’s recipe has that and it’s lovely. I add curry to egg salad too – it’s so good!! Hi, what brand of crackers? Ak Mak, which we buy from our local Earth Fare but they can also be ordered from Amazon. I love how simple this recipe looks and how few ingredients you actually need to make it with too. Looks yummy and one ill be adding to my list to try. Sounds great! I bet this would be good with flavors such as raisins, pineapple & coconut. ugh. not chicken. chicken is not a real food. it’s a dead food full of suffering and drugs to make it bigger. Umm, what? We buy our chicken from a local farmer. They provide the chickens with space to roam outdoors and a quality diet. Chicken, water, soybean oil, whole eggs,egg yolks, cultured milk and cream,milk cream, onions, whey,modified corn starch,high fructose corn syrup,distilled vinegar,salt, sodium phosphates,modified food starch,sugar,soy lecithin, vinegar,lemon juice, calcium disodium EDTA,Guar Gum,Carageenan,calcium sulfate, rice starch,mal todextrin, cultured dextrose, corn sugar,extractive of black pepper –(Ok I’m getting a little tired but I have 20 more ingredients)extractive of celery, citric acid, locust bean gum, spices, lactic acid,mono and diglycerides, sodium casinate, sodium benzoate, and potassium sorbate, acetic acid, natural and artificial flavors, lemon juice concentrate,dehydrated parsley,paprika, kosher gelatin, sodium citrate, enzymes, apple cider vinegar, cultured sugar turmeric, onion powder, garlic powder, xanthan gum. I will totally try this, it looks so good. I pack shredded chicken in my lunch as a snack but this will be perfect for a meal. Also I didn’t know that you were on “the fence” about eating raw veggies. Do you have information on why? Just wondering, I didn’t realize that. I eat lots of salads so..
On the fence about raw eggs (not veggies) due to possible salmonella. It’s not something we really worry about much, but as Lisa said, she’s on the fence about it. You and Vani were amazing in those interviews. I literally had tears in my eyes as I listened to you speak so passionately about this very important subject. I hope this is just the beginning of a food revolution in our country. Thank you for being a voice for all of us moms who are trying to do better for our children. Sorry about that, makes more sense about the eggs, and not raw veggies. Thanks again for the recipe. Also now that I’m eating clean I’ve lost over 20 pounds and feel great. I don’t 100% of the time, but I try on most days. Just a tip for easy shredded chicken…I boil my chicken and then when it’s done just put it in the kitchen aid with the dough mixer attachment and it shreds the chicken I’m about two minutes hands free!! Am loving the curry, yogurt and cilantro in this, great recipe! I wanted to chime in and say how much I LOVE e-meals. I started eating the organic/whole foods plan when I first started a journey to reduce processed foods in my diet. It really opened up my world to a whole new group of foods. the recipes are all cooked in under an hour, they are delicious, sometimes even fancy. I’m now using the clean eating plan, which is even less processed than organic plan and we are enjoying it as well. Portions are perfect for my family of two and I highly recommend it! I wonder if adding a splash of vinegar, maybe a flavored vinegar, would improve the flavor with plain yogurt? This site is a great resource for single men. Really, there is a whole demographic out there that really, really needs this cooking/recipe resource. Nothing says ‘home’ more than home cooking. Takeout, supermarket deli and fast food get old, fast. Thanks from a 40 something guy! Just made this curry chicken salad- so yummy! Thank you! I like it “wet” so added an extra 1/4 of the yogurt. I also bought ak mak crackers for the first time today… So reasonable and delicious for a cracker. Thank you for all that you do! We love using avocado in our chicken and tuna salads… just avocado mashed in there with s&p. It’s surprisingly good, I love it. It uses avocado, mustard, and lemon juice, and it is really delicious. Just wanted to second Catherine’s reply about your interviews on CNN and Dr. Oz. I’ve followed your blog for over 2 years now and have enjoyed taking part in your journey (as well as your recipes). It is so inspiring to see what a following you’ve built and how you continue to use your passion and intelligence to take this fight to the next level. I will be anxiously watching to see what changes develop because of all this media attention you’ve been able to garner with your petition. I use Emeals and LOVE them. I started using them to change up our menu, since I was noticing that we were eating the same 5 or 6 meals over and over again. The service has really done wonders for expanding our repertoire and our palattes. It also encourages my husband to cook because he knows we have all the ingredients and he has a quick simple recipe right in front of his face. I also use their breakfast and lunch menus. They are not clean eating menus but I tweak them so they are which actually makes it even cheaper since I am not buying things like premade tortillas and frozen waffles, etc. I just want to say I love your blog! I have 2 children aged 12 and 14. We eat fairly healthy already, but I would really love to give them some good reading material that will help them make better choices outside the home. I was wondering if you could recommend something that might appeal to a teen? They are tired of hearing me tell them about GMOs and side effects of this and that preservative; they think mom is always on a “health kick”. It’s hard for them to embrace this type of eating because they see all their friends eating junk without any adverse effects. There is also a lot of peer pressure at this age. I think if they read something they might decide to come on board with the why behind the food I bring (and do not bring) into the house. Thank you for all your dedication to make a difference. This fight isn’t just about food dyes, its about starting the change as a country towards healthier, more acceptable food choices that we deserve! As a parent, I’m thankful and even motivated to help make changes wherever I can, whether that’s in my child’s school, in my neighborhood, or even just at the next birthday party!Keep going, the fight is worth it! thought you’d like this. a bunch of people in my family have this and they love it! no more buying popsicles! all you have to do is blend some fruit then stick it in the mold. I love curried chicken salad but have never made it with yogurt before (I don’t have a problem with raw eggs as long as I get them from a local farmer so I make my own mayo) but I’d love to try it! I also like to make my chicken salad with lots of chopped celery and an apple…now I want to try combining the two types of chicken salad! Made mine with raisins, granny smith apples and sunflower seeds, yum! Greek yogurt was a bit tart for me, will try traditional next time. I contemplated adding honey to compensate, but that wouldn’t have done the raisins and apples any good. I love all the inspired suggestions on here, can’t wait to try more! I added a handful of golden raisins to this already delicious salad! Made the chicken salad last night and it was delicious for lunch today! I even used your whole chicken crock pot recipe for the chicken. Awesome! Mayonnaise is very easy to make and doesn’t taste anything like what you buy in the store. You can make it in just a few minutes. As for the raw egg yolk, I see nothing wrong with that, if your eggs are fresh what is the problem? You are more likely to get sick from raw vegetables. Yum… I love this idea. I can’t wait to try it soon! Thanks! PPS-think we could get them to change their slogan from “The Cheesiest” to “The Sleaziest”? I made this today for lunch – YUM YUM YUM!!!! Love the simple ingredients! I’m not a mayo fan so it’s great to see you use yogurt. What would you suggest to replace the chicken with for vegetarians? This is really good but I think a few raisins in it would make it outstanding. Would just add a little bit of sweetness! This is a great meal but sorry I would have to throw out the eggs and mayo. I have this meal planned for the weekend and will add the juice of a lime, three teaspoons of brown sugar, some crushed ginger and half a chilli from the bush in my back bedroom. LOVE that you are on the curry bandwagon! My kids (youngest now 22) grew up with curried chicken salad! Said youngest was the ONLY one in his foods class in high school who knew what curry was…..the teacher was actually astounded that he did and asked how he liked to eat it. Chicken Salad, of course!! We like to scoop with tortilla chips though! Or wrapped in some tasty organic Romaine! A wonderful hot-weather meal! Also, I recently discovered Curried Chickpeas…with spinach! A wonderful COLD-weather meal! I tried this recipe last night for my last night of the 10 day pledge, with a broccoli and carrot slaw mix that one of the local farmer’s sold at the market and it was amazing on crackers. Commercial mayo not be a real food, but homemade mayo is. And it’s easy. I have not problem eating mayo when I make it myself – soooo much tastier than store-bought. I also don’t use mayo very often, either, but if you make it yourself it is easy to make only enough for your immediate needs. Or, if the amount from one egg yolk is still too much, add about a half tablespoon (1.5 teaspoons) of whey to it and it will keep in the fridge for two months or so. I can’t wait to try this…I always hated Mayo anyway but I never thought to use yogurt instead. I am a big cracker snack fan and love ak mak cracker now! Thanks again for another great recipe! For the vegetarians use chick peas instead of the chicken–put it in your food processor. I also use chick peas for a faux tuna salad too. Tastes awesome! I made this for lunch today with leftover crock pot chicken and let me just say it was awesome! My 2 year old devoured it on pita bread and I enjoyed it over salad greens. Thanks for the great recipe! Just made this and am thrilled! So yummy and so simple to make. I used two organic boneless skinless chicken breasts. Tastes rich and fantastic! Thank you for the recipe. A terrific addition to this classic are grapes cut into halves (or quarters if feeding this to small kids). Delicious! I love curry chicken salad! A made this salad for an afternoon ladies lunch and everyone wanted the recipe! So simple and so good. Thank you for webbing this recipe. I recently had curried chicken salad for the first time and was/am hooked, but the ingredients looked iffy. Then saw your recipe and I am thrilled to use yogurt instead of mayo. Know your recipe will be used to create a wide range of curried delights. I love making this recipe, and always add in halved grapes to it. I wrap them with whole wheat tortillas, and add a thin layer of mixed greens on the tortilla first. I hate salad, and am always trying to find a way to mix my greens in without making my life miserable. lol. MMM.. I made with with greek yogurt (all I had on hand) and a little bit of mayo. Added grapes and didn’t have cilantro. It was still sooooo yummy! Crock Pot chicken (my first time making a whole chicken) was out of this world!!! Thanks so much for the recipe! Just made a batch. I sampled and it is delicious! Can’t wait to see how it is later after the ingredients merry for a few hours! Thanks! Adding sliced grapes and/or coconut sweetens this and keeps it real. We are dairy intolerant and wondering what to substitute for the plain yogurt. would you recommend vegan mayonnaise as a substitute or another condiment? I have never had much luck with curry either. What type/brand of curry do you use? thanks for the great information on your site!! Much better than a mayo version! Thanks so much! Yesterday I made your chicken in a crockpot. Today I made the broth and tonight I made the chicken curry. Thank you for all the great ideas!!!!! I love this recipe, but I always add a bit of honey– I think it pairs well. Today I tried it as an egg salad instead of chicken and served it on lettuce leaves for my lunch. It was REALLY tasty! What kind of curry powder do you recommend? There are so many types when I go to the store! Hi there. Just look for an organic version. :) Frontier or Simply Organic are pretty easy to find. Is there a brand/type that aid best for chicken salad? I have bought a few and they all have different flavors. Is there a brand/type that is best for chicken salad? I really like the Simply Organic. Mayo is made with eggs, a few spices, and oil (I use olive oil). Does this not make it a real food? Hi. This will clarify: https://www.100daysofrealfood.com/2012/04/17/real-food-condiments-do-they-exist/.